A couple of weeks ago I saw a post on BritMums asking us bloggers to take part in a food challenge. I love anything like that so I immediately applied! 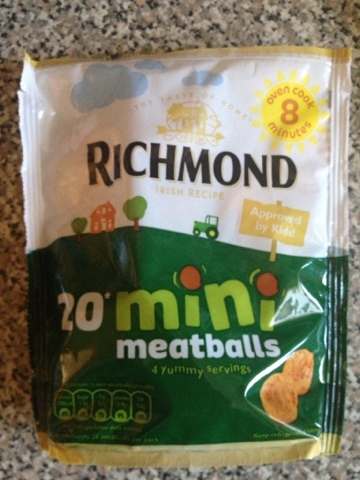 The children were excited to get involved to and as soon as the pack arrived we headed straight to Tesco's to pick up a pack of 20 Richmond's Mini Meatballs. I asked the Mister A & Little E what meal they thought we should make and they came up with a few ideas - pasta, pizza and kebabs. 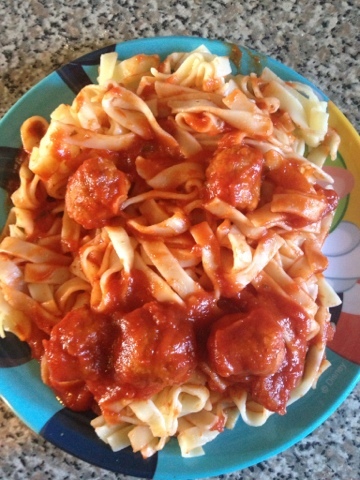 Mister A came up with the name when he saw the tagliatelle - he said it looked like bandages so we added the passata and placed the meatballs to make eyes and a mouth. This was so quick and easy to make - and would be great for a Halloween meal! 1. Place the tagliatelle in to a pan of boiling water and cook on the hob for 12 minutes or until cooked. 3. Transfer the pasta from the pan to a colander to drain. Then add the passata to the pan and heat for 2 minutes. 4. Once heated through mix the pasta with the passata and serve. 5. Add the meatballs to make a face! 1. Cut a 15cm x 15cm square out of a puff pastry sheet. 3. Grate cheese and add it on top of the tomato. 4. Cut 3 of the meatballs in half, leaving one for the centre. 5. Arrange the meatballs in to the shape of a flower. 7. Bake in the oven (Gas mark 7) for 15 minutes. 1. Cut a strip of puff pastry from your sheet - I used a 1cm thick but you can increase as you wish. 2. Push the pastry on to the stick at the end then add a meatball. 3. Wrap the pastry around the meatball and add on to the stick again. 4. Repeat until you have 3 meatballs on your skewer. 5. Glaze with egg wash the place in the oven for 12 minutes. 6. Remove from the oven and sprinkle with grated cheese. 7. Bake for a further 3 minutes. 1. Cut a strip of puff pastry around 20cm x 7cm. 7. Bake in the oven (Gas ark 7) for 10 minutes. We absolutely love these little balls of fun. They can be cooked in the microwave or in the oven and they are so versatile. Check them out - they're on offer at the moment for only £1 per bag in Tesco. 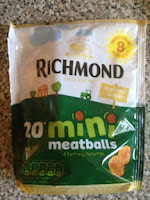 This post is an entry for BritMums’ Hungry to Happy Challenge sponsored by Richmond Mini Meatballs.